At seven of the highest points in the Russian capital, you can not only enjoy a spectacular view, but also eat, drink and dance. 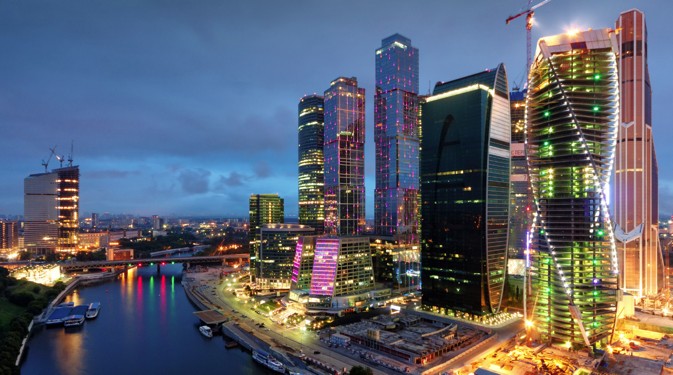 The Empire and the Federation Towers, which are located in the new business centre in the immediate vicinity of the city centre, are part of the tallest complex of buildings in Russia’s capital. Standing on the high-altitude terraces of Moscow- City you can enjoy truly inspiring views of the Moscow River and the western part of the city. The Sixty Restaurant - Bar (the name refers to the interior, which has been executed just like in the 1960s) on the 62 floor of the Federation tower, which makes it the highest restaurant in Europe. The average bill is around 4000 roubles /$140. You can enjoy views of the city from a bird's eye view free of charge too – you will just have to reach (on an express elevator) the new terrace of the Empire Tower (which is on the 58 floor), located at an altitude of 238 metres. One of the most popular postcard views of Moscow is from the observation deck of Vorobyevy Gory (Vorobyevy Gory or University metro station). The landscape is especially beautiful on a clear day and late at night when the city lights are turned on. The capital can be seen as if it were in your hands; this is definitely the best place for gazing at the seven Stalin skyscrapers – the famous “Seven Sisters”. From the upper floors of the Moscow State University main building, you can take in an even more breathtaking panorama. You can enter the Moscow State University terrace if you sign up here – 8 (495) 939 2976. A bar with rather affordable prices (an average bill of 1000 roubles /$35) and a terrace with simply stunning views of Moscow. Time Out Bar is located on the 12th and 13th floor of Hotel Peking in the heart of the capital (Mayakovskaya, Triumph Square metro stations.) This is one of my favourite places, which can be found in Moscow skyscrapers; here bartenders prefer making signature cocktails. 5, Bolshaya Sadovaya Street. Open from 12:00 pm to 6:00 am. City Space is the highest bar with a 360-degree view of the capital. It is located on the 34th floor of the Swiss Hotel Red Hills, and according to the 2008 Bartender's Guide, it was included in the top 10 bars in the world, and the top 50 best bars in the world by Drink International 2011. The price of one cocktail is around 900 roubles/$30, a must drink for the capital guests is the legendary Moscow Spring Punch with ginger, raspberry and honey. 52/6 Kosmodamianskaya embankment, Paveletskaya metro station. You can have the possibility of seeing old Moscow from a bird’s eye view if you go up to the 80-metre bell tower of Ivan the Great – “the capital’s first skyscraper” which was built in the 16th century. The belfry is located in the heart of the city – right in the Cathedral Square, (it is adjacent to the Red Square). The exhibition is open to visitors and there is also an observation deck, which offers a wonderful view of the Kremlin's Cathedral Square and the old streets of Zamoskvorechye. You can enter with a ticket from the Kremlin Museums. You can enjoy the view from above with a cup of coffee, which you can get close by – on the rooftop of the Ritz Carlton, where there is a cozy 02 Lounge, which offers an unforgettable view of the Kremlin. The average bill is approximately 2500 roubles/$80. 3, Tverskaya Street. Ritz Carlton, 11th floor. The Ostankino Television Tower observation deck has been open to visitors for over 40 years. During this time it has been visited by over 10 million people – from a height of 340 metres you can take a look at northern Moscow and the Moscow region. You can get to the site only as a part of a tour and preferably having booked in advance. Duration of the tour is 1 hour, the tower is open to the public from 10.00 am to 21.00 pm. Pre-registration can be done by phone 8 (495) 926-61-11, it will cost 980 roubles ($28). 15/2, Akademika Koroleva street, Alekseevskaya metro station. Located on the 21st floor of the Lotte Plaza on Novy Arbat, Kalina Bar offers visitors a panoramic view of the Moscow City towers, Hotel Ukraine, Old Arbat street, Cathedral of Christ the Saviour, and many other monuments in the city centre. Besides this it offers great Western and Asian cuisine with a bill of approximately 2,000 roubles /$70. 8, Novinsky Boulevard. Lotte Plaza, 21 floor.